Madrid-based Galeria Javier López & Fer Francés committed to strengthen their collection of Spanish art and prove their sayings with the first solo show of Manuel León entitled ‘El Traslado’. 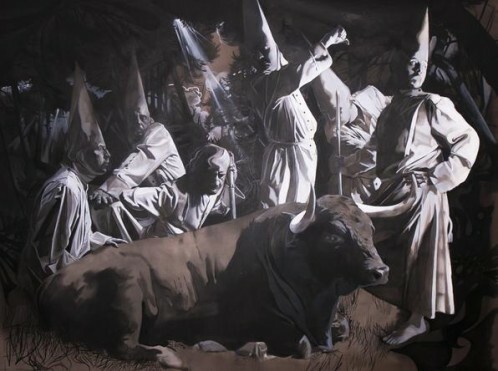 Being the first exhibition with León in the gallery they already introduced the painter into numerous of their fair representations, including Art Cologne, Istanbul ArtInternational and Cosmoscow. Strongly dedicated to watercolors, León’s core subject for ‘El Traslado’ is the religious Easter feast and its processions. Leon easily transitions from black and white to colors, with a main focus on his characters and their actions. The transition process of this exhibition allows him to decorticate and sublimate the movement, the body positions, expressions and devotion. The compositions allude directly to the one of the Spanish Great Masters – Velasquez or El Greco being two cornerstones leading his paintings. 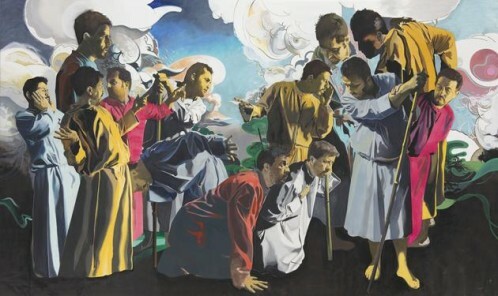 ‘La lógica del sentido’ is a foremost piece of the exhibition, inhabiting bright colors, generic religious scene with an urban background and an intensive attention paid to the facial and body expression. La lógica del sentido, 2014. Oil on canvas. 100 x 161.40 in. No se puede dar a Dios por sentado, 2014. Oil on canvas. 74.75 x 98.40 in.